Description: M384 gets off the NS at Alexia Junction and heads north on the Ann Arbor Railroad to reach their trackage in Diann, Michigan. 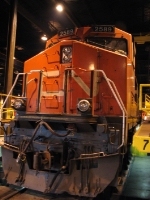 Description: CN 2589 sits in Joliet waiting clearance on the elevated BNSF line. Description: CN Railway rolls up their Elsdon sub and will soon enter the connecting track to the IHB. Description: CN heads up the Connecting track Westbound to the IHB. Title: CN 2589 with 308 at Mile 260 Kingston Sub.